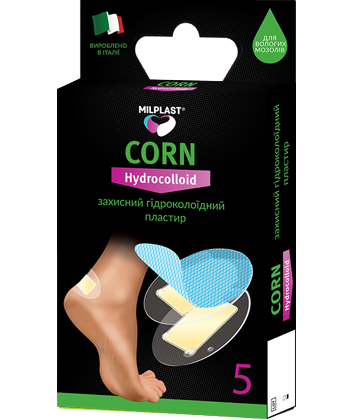 Hydrocolloid plaster Milplast Corn Hydrocolloid is developed for the prevention and treatment of dry and damp hands and feet calluses, abrasions and cuts. It not only covers the wound, but also heals it, accelerates the natural healing processes of the wound. Hydrocolloids absorb the wound secret of the callus and form a gel pad - create a moist environment in the wound, reduce the risk of infection, providing complete protection of the wound. For external use. Do not leave plaster on the skin over 12 hours.